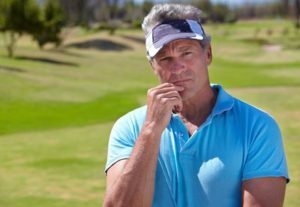 I am aging golfer, and have friends who belong to same demographic, and since I work out a lot, my golf performance has been steady so far, but in the past 1-2 years, I’ve noticed a slight decline in my performance. And it got me really curious – for one, to predict how worse I’m going to get, but also I was curious to find out what the underlying reasons are. Since my friends expressed interest as well, we decided to sit down and do a little research to find out what the future holds for us. First of all, I wanted to find out reasons for the decline. Aging by itself is correlation but not causation. I found out that your swing speed and hit speeds start to decrease because of reduced muscle power in my hands. Some skills such as coordination and stance improve as you gain more experience, but in the end, diminishing hand power still outweighs advantages of handy traits that you get by experience. So in the long run, no matter what you do, you can’t fight aging process, but simply have to accept it. Now let’s get back to topic of how aging affects your performance and when. At first, I noticed decline in my driving distances for past 5 years. So I requested the numbers from my friends as well to have a better perspective on data. The pattern seemed to suggest that driving distance started to decline from age forty, and got way worse after golfers turned fifty. In my case, I didn’t notice any changes until I was fifty, so I guess working out really helped to slow down my decline. We should also consider change in quality of my golf club set over the years. When I was in my twenties, when I had just started playing golf, I didn’t want to invest in fancy golf club set, so I got affordable club set to start out. So my results might have been affected by mediocre golf clubs. In my thirties, I actually spared some money to get myself high end golf clubs and it affected my results. I’ve also noticed that my peers peaked in their thirties as well. In their forties, people who tried to live healthy and walk on golf course instead of driving a cart, weren’t affected very much. It might also be result of having good golf clubs made for seniors, but data isn’t big enough to be entirely sure. So my takeaways from this little experiment was that working out and being active is the best way to slow down aging process. If you’re good at choosing golf clubs for yourself, spending a little more on seniors golf clubs might also help. But after some point, spending more on golf clubs is pointless and is not going to make you better golfer.